Do you care who is appointed the guardian of your minor children if you die? Wills are not just for the rich and wealthy. Regardless of how much or how little money you have, a will ensures that whatever personal belongings and assets you do have will go to family or the beneficiaries you designate. If you own a business, a will can help ensure a smooth legal transition of those assets. Beyond your property and personal belongings, if you have minor children, a will is a must. A will ensures that you get to choose your children's legal guardian should you pass before your children are of legal adult age. 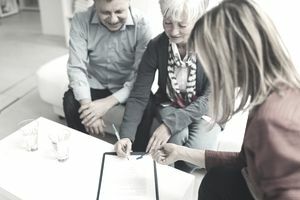 Through a will, you can also name what is known as an executor, or the person with whom you trust to have the authority to ensure that your wishes are carried out and to ensure that all of your affairs are in order from paying off bills to canceling credit cards. Without a will, a court makes these decisions on your behalf, among others, through a lengthy and often stressful process called probate. Few people plan to die in the near future, but if you die suddenly without a will, you will inadvertently subject your family and loved ones to unnecessary confusion and anxiety at what is already a difficult time. For most people, a will is easy to produce and can be prepared using legal software such as Quicken Willmaker Plus (Nolo Press, about $50), which also helps you create a Living Will, Living Trust, Bypass Trust, Financial Power of Attorney, and other important legal forms. If you have a more complicated estate, or you're not comfortable using software for the more complicated documents, you should consult an estate attorney who may also work with a Certified Public Accountant (CPA) or financial planner. At a minimum, a will at any stage in your life should do the following: appoint a guardian if you have minor children, appoint an executor to administer your will when you die, and spell out specifically how you want your property distributed. You will also need to keep some record of amounts of all debts, including mortgages, car loans, student loans, business loans, and credit card accounts. Of course, you should also keep copies of existing wills, trusts, divorce decrees, prenuptial agreements and any other legal documents that might affect your will. If you decide to create your will yourself using software like Willmaker, you can sit down in front of your computer with all of the above information and in a few hours produce a will that is legal in your state. If you feel more comfortable having a lawyer do it, you'll need to be prepared to take the above and perhaps other information with you to your appointment. As life changes, it is also best to revisit your will periodically or upon certain major life events to ensure that your will still reflects your desires. Last, but not least, the best of wills won't be any good if nobody knows how to find it. Make sure your family members and your executor know where your will is kept.